Matthew Apgar - mapgar@shawmedia.com Election judge Karen Hutchings talks with other judges inside the nursery which also served as a poling place on Tuesday, April 7, 2015 at Tom's Farm Market & Greenhouse in Huntley. Polls lined the budding flowers inside the nursery as judges awaited citizens to exercise their rights to vote for elected officials. 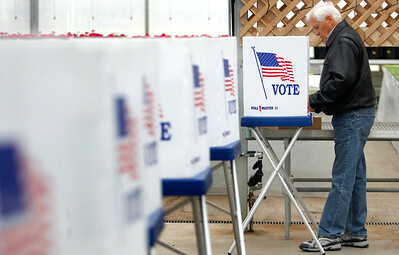 Matthew Apgar - mapgar@shawmedia.com Tom Dunn of Algonquin casts his vote inside the nursery which also served as a poling place on Tuesday, April 7, 2015 at Tom's Farm Market & Greenhouse in Huntley. 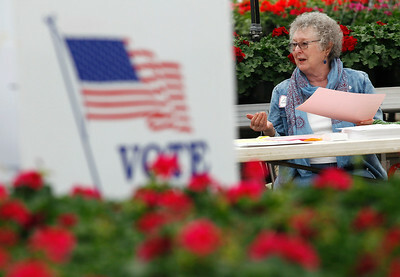 Polls lined the budding flowers inside the nursery as judges awaited citizens to exercise their rights to vote for elected officials.